Press the clutch pedal when the shift lever is in the N (Neutral) position. 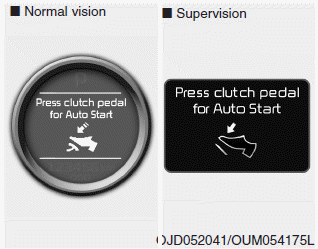 A message "Press Clutch Pedal for Auto Start" will appear on the LCD display. 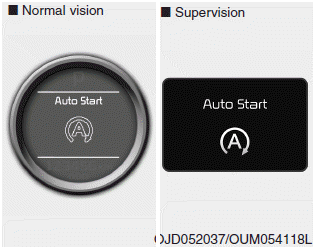 The engine will start and the green AUTO STOP ( ) indicator on the instrument cluster will go out. - The fan speed of manual climate control system is set above the 3rd position when the air conditioning is on. - The fan speed of automatic climate control system is set above the 6th position when the air conditioning is on. - When the defroster is on. - The vehicle speed exceeds 5 km/h (3 mph). The green AUTO STOP ( ) indicator on the instrument cluster will blink for 5 seconds and a message “Auto Start” will appear on the LCD display.